Toshiba is not a company normally known for pushing the bounds of laptop innovation and design. But change is afoot — first, with a surprisingly good full HD Chromebook, then a cheap-and-quite-cheerful Windows convertible, and now a fantastically bonkers 12.5-inch convertible laptop with a 4K Ultra HD display. The Satellite Radius 12 is being announced at the IFA trade show in Germany today, and while Toshiba is keeping some important details under wraps, we do know about one thing: that screen. It’s a 12.5” touchscreen IPS display, with a resolution of 3840 x 2160, and certification from Technicolor for movie-studio accuracy. That’s an absurdly high-resolution panel to fit into such a tiny body. The Radius 12 fits a more pixel-dense display into a smaller body than Dell’s XPS 13, a laptop whose screen we waxed lyrical about. And it blows the new 12-inch Macbook, with its 2304x1440 screen, clean out of the water. In a world where packing as many pixels as possible into a small space is often key, Toshiba might’ve just won. Of course, resolution is not actually everything: Windows has a well-documented problem handling high-resolution displays, and after a point, adding more pixels doesn’t actually do anything to make the picture better — they become too small to see with the naked eye. There’s also the guts powering the computer to consider. 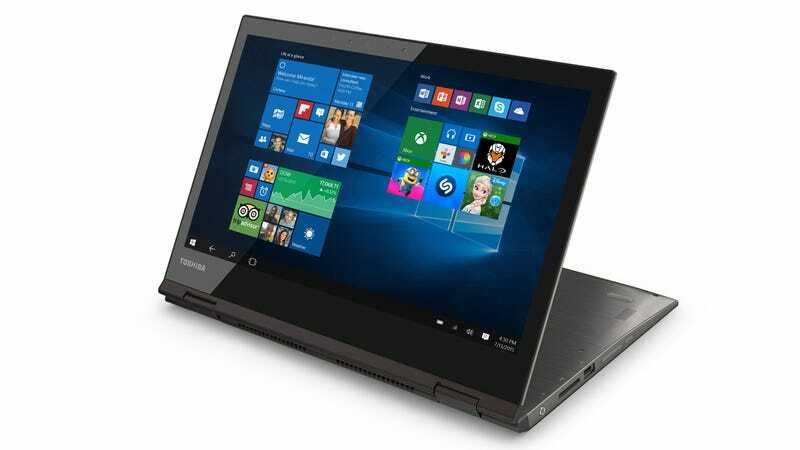 Toshiba has said that the Radius 12 will be packing “6th Gen Intel Core processors”, which could mean anything from a fairly puny Core M, to a quad-core i7 with powerful onboard graphics. If it’s the former (quite possible in a machine weighing under three pounds), then that high-resolution screen will just slow everything down, and you’ll end up watching a very pretty but very slow slideshow. Apart from the screen, we don’t know too much: it’s a convertible laptop that can fold all the way back into a tablet, or anything in between, with an aluminium body, Gorilla Glass screen, USB-C support (though not for charging), and integration for Windows 10’s facial recognition login. For more details, we’ll have to sit tight — launch is scheduled for the fourth quarter of 2015.